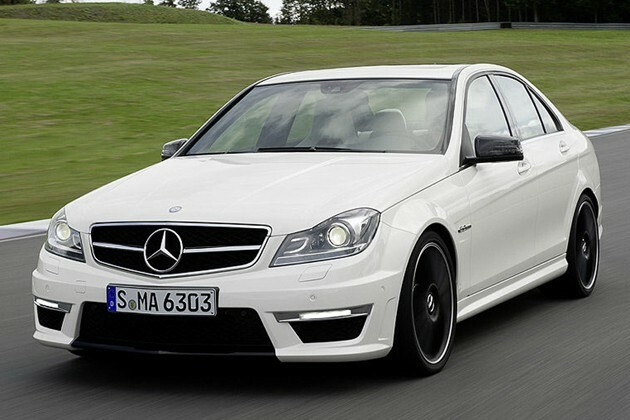 The new upcoming 2012 Mercedes-Benz C63 AMG is poised to be an out-right beast. We already had a glimpse at previously leaked images of the 2012 C63 AMG from various automotive sources but now even more images have leaked out onto the internet. The new revised C63 AMG (and C63 AMG wagon) features most notably a new aggressive grill, LED fog lights and reworked headlights. Underneath the refreshed styling lies the joy of the newest model, a 6.2-liter naturally aspirated V8 engine with 451 horsepower and 443 pound-feet of torque. Power will be directed to the rear wheels through a seven-speed ‘SpeedShift’ MCT transmission good for propelling the small form-factor Benz from 0 to 60mph in 4.6 seconds all while getting an average of 19.6 miles to the gallon.